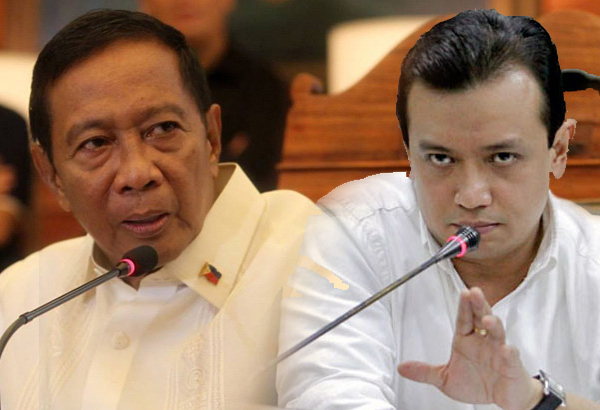 MANILA — The camp of former Vice President Jejomar Binay on Tuesday tagged Senator Trillanes as the ‘father of fake news’ in connection with the libel case filed by the Department of Justice (DOJ) against him before the Makati Regional Trial Court. This, as the DOJ found probable cause on the complaint against the senator over his malicious statements against Binay in 2015. Joey Salgado, Binay’s spokesman, said the indictment exposes Trillanes as a “fake crusader against fake news”. “Kung pagbabatayan ang kasong isinampa ng DOJ, lumalabas na si Senator Trillanes ay nagkakalat ng fake news simula pa noong 2015. He deserves the unflattering title “father of fake news in the Philippines,” Salgado said in a statement. Salgado noted the indictment was a vindication for the former Vice President. “It confirms what we have been saying all along: that the Senate hearings were in aid of political demolition, not legislation. And Senator Trillanes hid behind his parliamentary immunity in order to pollute the people’s minds with lies as part of a well-orchestrated demolition job against former VP Binay,” he explained. “That on or about 19 August 2015, the above named accused did then and there willfully, unlawfully, feloniously, and with malice in fact, publicly made the following statement without regard to truth or falsity thereof and caused the same to be published… thereby defaming, maligning the reputation and causing the dishonor of then Vice President Jejomar Binay to his damage and prejudice,” read the information filed by Senior Assistant State Prosecutor Edwin Dayog and approved by Senior Deputy State Prosecutor Richard Anthony Fadullon. The article said Trillanes would expose during the Senate blue ribbon subcommittee hearing the PHP100-million racket of Binay in Makati City.